Cassin's - P10 short (20mm), not reaching half way down P9. The Red-crowned Malimbe occurs in Cameroon, Central African Republic, Equatorial Guinea, Gabon, Congo and DRC (see map below, based on Birds of Africa). There are no subspecies of the Red-crowned Malimbe. 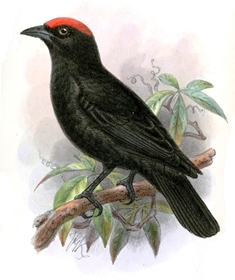 The Red-crowned Malimbe inhabits primary lowland forest, sometimes in swamp forest, mature secondary forest and orchards. The Red-crowned Malimbe feeds on caterpillars, grasshoppers, cockoaches, small beetles and insect eggs. Nestlings are given grasshoppers and caterpillars. Birds forage in the canopy, often in dense screens of hanging lianas and clusters of leaves. They occur in pairs or groups of up to 7 adults; and often in mixed-species foraging flocks. The Red-crowned Malimbe is a monogamous, solitary nester. The nest is built collaboratively by up to 6 adults. When the nest is complete, the helpers disappear and only the breeding pair remains. The nest is an untidy, pendent structure made almost entirely of dead, dry plant material. Nest material includes vine tendrils (sometimes spiral ones); interwoven with small, bent or straight twigs and small and large petioles. The egg chamber is suspended by a long anchoring structure from a thin thorny liana stem or tip. There is a short but wide entrance tube. The outer parts of the nest have many outward and downward pointing stiff stems embedded into them. The whole, hedgehog-like nest is thought to be an effective anti-predator structure. The nest is sited above an open airspace, sometimes a path, usually at a height of 8-9m but up to 25m high. Adults find it difficult to fasten the first dry twigs and tendrils to a hanging vine and most material falls down at the early stages of building. As a result most nests are abandoned during the course of building. Nest-building is by a group of birds that arrive together and work in bouts, birds coming to work at the nest one after the other and calling continuously. Males and females work to the same degree, and a nest takes 2 weeks to complete. Both parents incubate and feed the young. Many nests are destroyed by chimpanzees Pan troglodytes. The Red-crowned Malimbe has 1 PHOWN record, from Gabon. Many more PHOWN records are needed for this locally common species (see PHOWN summary). This species roosts in old nests at night and sometimes rests in them by day, so observe nests year round. Submit any weaver nest records to PHOWN (PHOtos of Weaver Nests) via the Virtual Museum upload site.